From SMT to DIP on a Paper Breakout – Paper Electronics via @chibitronics « Adafruit Industries – Makers, hackers, artists, designers and engineers! A 10W, 5V buck regulator laid out with paper electronics. The final layout closely resembles the datasheet layout example and performs smoothly at 2A load; this circuit probably wouldn’t regulate properly at high loads if built with a SMT-to-DIP breakout and a breadboard. I’ve spent a considerable portion of my time in the past couple of years helping to develop products for Chibitronics, a startup that blends two unlikely bedfellows together, papercraft and electronics, to create paper circuits. The primary emphasis of Chibitronics is creating a more friendly way to learn, design and create electronics. Because of this, much of the material relating to paper circuitry on the Internet looks more like art than electronics. 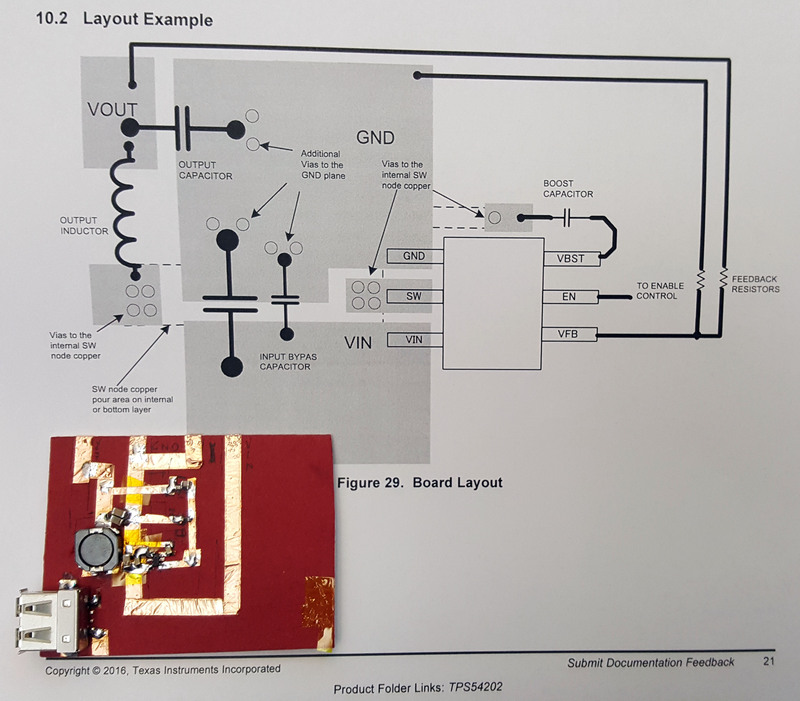 Paper as an electrical engineering material is something I would never have thought of on my own – I grew up prototyping with breadboards and wire-wrap, and I was prejudiced against paper as a cheap, throwaway material that I incorrectly thought was too flammable to solder. Instead, I spent hundreds of dollars on breadboards and wire wrap sockets, when I could have made do with much cheaper materials. Indeed, there is an irrational psychology that regards expensive things as inherently better than cheap things, which means cheap options are often overlooked in the search for solutions to hard problems. Read more here for lots more perspective and intel.